Asanko Gold (AKG) is falling again, the price went down to .87 August 3 without any company-specific news. In this article I will try to reconstruct why the company’s share price is cratering, building on my previous article: Why Asanko Gold Is Crashing, while adding fresh data as the stock dove another 50% since that article was written. This article will be composed of three parts: in the first we will shortly describe what Asanko is and what are they doing. In the second half we will assess what the short side is saying about the company’s business and what happened in the last 3 months. In the final part I will synthesize it all make an educated guess about how this story will unfold. Asanko Gold is in the business of mining gold in Western Ghana and is a development-stage gold miner that began commercial operations at its namesake Asanko Gold Mine in April 2016. In 2017, it was expected to produce an estimated 230,000 to 240,000 oz Au, recently revised down to 205-225’000 oz in the most recent guidance. 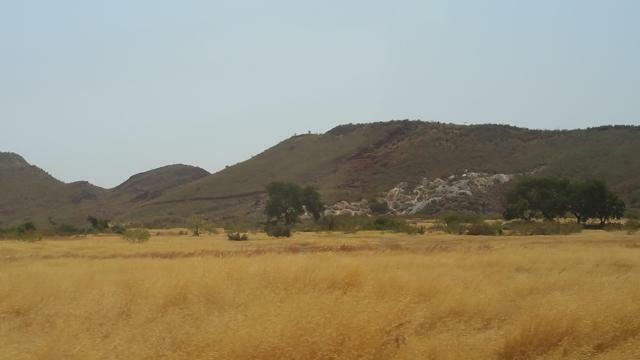 The business plan stated that there would be a sequence of pits that would be mined, starting with the Nkran Pit before moving to satellite deposits like Akwasiso in 2017 and Dynamite Hill in 2018 and to the two big Esaase pits in 2019. However, technical and economical issues arose through being ahead in the mining of the ore rich part of the Nkran pit, while being behind with the waste rock disposal. The company is using new models and technologies in order to improve the model-mining reconciliations and is using blast movement technology to identify ore losses and dilution. Blast movement resulting in higher than planned dilution are being blamed for the lower grades and ore losses. I salute management for trying to find solutions and wish them the best. In the meantime let’s review what the short side has to say about this company. The two short theses for Asanko are the ones expounded by Muddy Waters and by K2 and Associates. K2 and associates is a Toronto-based hedge fund that has been shorting Asanko since June 2016, when it was still around $4.40. It seems that the main reason for K2 to start shorting Asanko was the fact that its gold resources were overinflated. This applies specifically to its Nkran deposit, which Asanko acquired from Resolute Mining Ltd in 2014. K2 published a compelling 33 page report and the arguments brought forward were reiterated by K2 in this article from last February here on Seeking Alpha. The report provided some interesting satellite images showing how the company was mining ahead of the feasibility study and the collapse of a part of the western flank of the Nkran Pit. 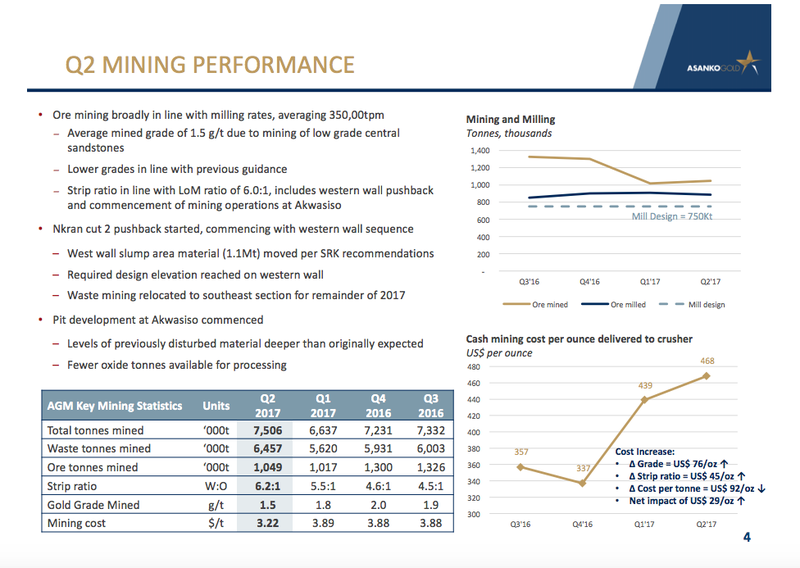 K2 goes at length, using review of historical drilling and technical work, Asanko’s disclosure and guidance, to demonstrate how the company’s mine performance at Nkran has produced less gold from reserves compared to its Definitive Project Plan feasibility study. It also incorporates data from Resolute Mining’s previous experience with mining the orebody. K2 also shows how the company was supposed to strip the pit with two CAT shovels: the large CAT6030 with 10.1Mtpa of mining capacity and a smaller CAT6015 with 4.8Mtpa of mining capacity for the mining of the gold bearing ore, while it was at the time already using two CAT6030, implying a 40% bigger monthly moving capacity due to the necessity of disposing of more waste material and faster mining of the orebody than expected in the feasibility studies. Muddy Waters is a famous short seller specialized in account or other frauds in publicly traded companies. Muddy Waters’ trading outlook is that the company’s shares will drop to zero. The fund notes that Asanko’s liquidity was limited to $48m of cash on hand, with no availability on its $150m revolver credit (long term debt that has to be repaid later on). Using ‘company-favorable assumptions’, they estimated that Asanko will have a cash shortfall ranging from $43m to $129m in 2018. Muddy Waters’ report can be freely accessed here. Basing themselves on flawed geology, AKG made investments in Nkran, Esaase and other deposits, that the fund believes will never be recovered. Muddy Waters claims that the western Nkran wall suffered a significant collapse, something that seems to be confirmed by photographic evidence. 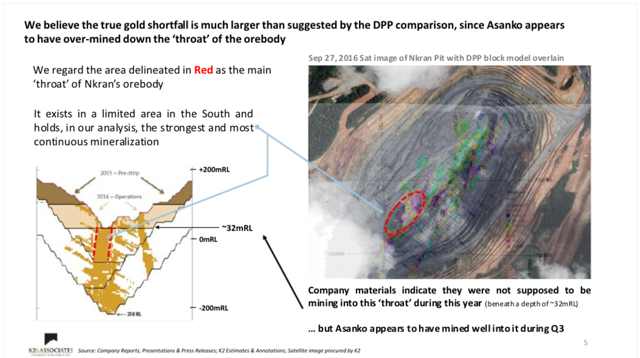 Muddy Waters estimates that Asanko needs to spend $75 – $115m soon to push back and move the collapsed material as to avoid a mine “pinch out”. My comment at the time was that this was a two-edged sword: spending this kind of money would likely mean that AKG will run out of liquidity in 2018, whereas not spending the money leaves the company without the cash flow to develop its largest deposit later, Esaase. Asanko’s satellite deposits are unlikely to yield significant cash flow due to assumed flawed geology. 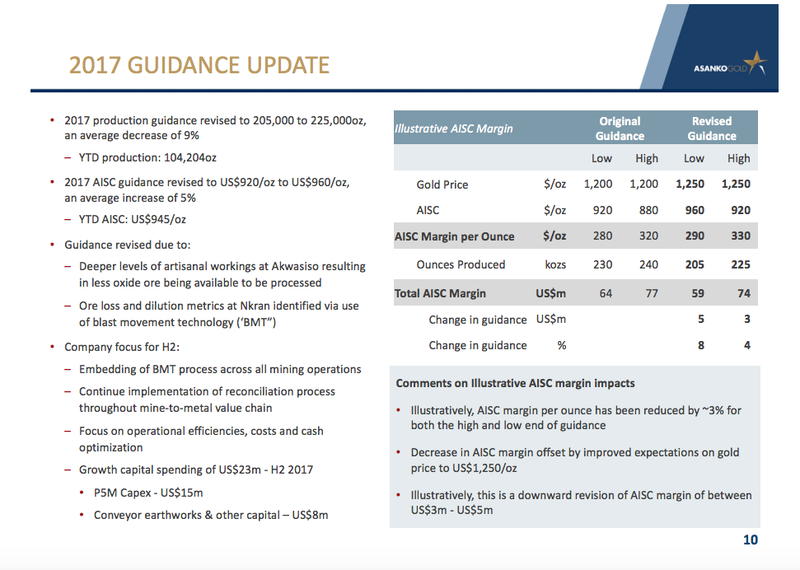 This was previously obscured due to the fact that in a December 2016 upgrade to their resources, AKG used a record gold price – $2,000/Oz – to boost their estimated value. This is clearly one of the most serious flaws as the gold price currently hovers around $1,265/Oz. Muddy Waters believes to have found indications that some of AKG’s resource models have been ‘smeared’, which would mean that estimates of their ore contents are inflated. Management is outwardly assured and confident, but their behavior reeks of desperation and short-termism. Finally, Muddy Waters notes that the capital cost to build Esaase is estimated at $100-110m. This money has to be provided from the cash flow, while the company should essentially be lowering its long term debt before seeking refinancing next year. All very compelling arguments. Let’s see how (or rather, whether) Asanko is addressing them and what to do. Since last May, the company issued some press releases trying to rebut the shorters’ theses and providing a new “expansion DFS” where it refines the numbers of the expansion plan and is generally optimistic about everything. (we) Maintain our production guidance of 230,000-240,000 ounces for 2017, which we continue to expect will generate between US$64-US$77 million in cash this year assuming $1,200/oz gold. Two short months later, projected production is down 10%. By reading the press release we discover that in Q2 2017, compared to Q1, the mined waste is up 10%, the gold feed is down to 1.7g/t from 2.1g/t and that recovery stands at 94% instead of 95%. Other important data points include the total gold sales of 48,461oz AU at an average realized price US$1,238/oz for $60m in gold revenue with an AISC that decreased by 3% to $930/oz. The company made $34m in operating cash flow with a net income of $1.2m or $0.00/share and currently has $59.1m in cash and immediately convertible working capital. After re-reading the thesis of the shorts, I am starting to lean towards their position; management is keeping this company afloat by cutting corners. Give a look at the 2017 Guidance (below). AISC is up, while margin is down even while using a revised higher gold price. The company is trying to improve the dire state of affairs it finds itself in. At Nkran, the cut 2 phase of the pushback of the side of the pit has recentlystarted and it will be followed by the restart of the western wall sequence including the slump area material (1.1Mt) in line with the SRK recommendations. Per Muddy Waters’ calculations the company will need at least $75m to complete this phase. The financial resources necessary to move all this waste rock will supposedly have to come from current cash flow as will the money necessary to pursue the 5M and 10M expansion programs where the company will incur another $120m more in capital costs. Can Asanko find $160m to refinance the long term debt due in 2018 + find $120m to build the next pits including Esaase + $90m to strip Nkran (if it is even worth at this point and at this gold price)? We now know that the company is still afloat in Q2 2017 and made $1.2 million in profits while scrambling some CAPEX towards solving these important questions. We also know however, and this is new, that one of the margin shallow oxide and easy to mine deposits, the Akwasiso, where mining has commenced recently, is yielding lower oxides than expected because of massive artisanal mining that somewhat depleted them at surface. This is again bad news for Asanko, as it could be that this phenomena is valid for the other shallow deposits in portfolio as well. In conclusion, I believe it to be a prudent move to sell Asanko at its current price and continue to stay on the sidelines at least until the market cap of Asanko halves and the share price does not go to $0.40. I will continue to follow Asanko so stay tuned and thank you for reading. 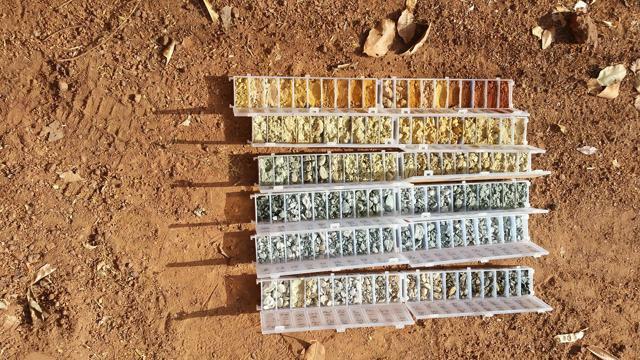 In this article I will start coverage of a new small gold explorer in Burkina Faso, Nexus Gold (NXXGF). This article will not issue a formal trade recommendation. The aim is to provide the reader with an unique inside about this firm and give food for thoughts. The article will be structured in two parts: a short introduction about mining in Burkina Faso, followed by an analysis of Nexus Gold. All figures in US Dollars if not stated otherwise. Burkina Faso is fast emerging as the go-to destination for gold mining in Western Africa. One of the main advantages that Burkina has over other jurisdiction in the region is that until now it was less explored than neighbouring Ghana and Mali, while being endowed with the same favourable geological structures, the birimian greenstone belt of West Africa. Burkina Faso is the fastest growing – and currently fourth-biggest – gold producer in Africa and gold recently became the biggest export product of the country, having overtaken the traditional cotton. Although the country saw some political strife in recent years – former president Blaise Compaore was deposed in 2014 and there were some problems with a temporary military junta in 2015 – Burkina Faso is actually remarkably stable for African standards, and when I was there in November 2017, there were no signs of political tension. Local elections were held in 2017 and the local population, although 60% Muslim, does not seem to be interested in the propagation of radical Islam, rather different religions coexist peacefully in the country. Most important to us, there is no precedence for domestic political issues ever affecting gold mining or stopping the local government from awarding mining licenses. This is also reflected in the fact that the country scored remarkably well in the 2015 Fraser Survey of mining companies: it is in the first quartile of this survey, which is composed using answers from industry professionals operating around the world. The government approved construction of more than 10 gold mines in the last few years. Burkina Faso has a low corporate tax rate of 20% for mining companies, the government is also entitled to a 10% free carried interest in mining operations and a 3-5% sliding royalty on gold production is in place. All in all, taxation and government support appear to be more than acceptable compared to global standards. As a further proof of the good business climate in Burkina Faso, we can note that the government approved more than 10 gold mines in the last few years, with three major deals in 2013, when three majors – B2Gold (NYSEMKT:BTG), Centamin (OTCPK:CELTF) and Teck (NYSE:TECK) – all bought gold projects Burkina. In 2014, there was an Acacia Mining (OTCPK:ABGLF)/Sarama (OTC:SRMMF) JV, while 2015 saw the acquisition of Orbis Gold by SEMAFO, Endeavour Mining’s (OTCQX:EDVMF) acquisition of True Gold and Gryphon’s acquisition by Teranga (OTCPK:TGCDF), which was one among many other small deals. Other notable companies operating in Burkina Faso are Roxgold (OTC:ROGFF), which had their first gold pour in May 2016 at the first underground gold operation in Burkina Faso, Orezone (OTCPK:ORZCF), which owns the massive Bombore project (also a project that I visited and will write about soon), IAM Gold (IAG), which mines the Essakane mine (discovered by the Orezone team) and Nordgold, a Russian privately held gold-focused major miner, that operates the Bissa mine, just east from where Nexus is looking to find gold. I was intrigued about Nexus gold properties while researching the Burkinabe gold sector. It is still a relatively unknown actor in this space. Nexus owns three properties in Burkina Faso, all of them easily reachable by paved road 1.5 hours north from Ouagadougou, the capital city of Burkina Faso. I toured the properties with Warren Robb a seasoned geologist with over 25 years of experience and currently Nexus’ chief geologist. In 2012, Mr. Robb served previously as chief geologist for Roxgold (ROGFF), where he supervised both field exploration and the diamond and RAB drilling program on the company’s Yaramoko gold property located in the Hounde Belt, western Burkina Faso. Niangouela is the first property that I visited. Below a view of how the property looks now. The region is flat with some small hills. On the side of this hill you can observe the grey coloured tailings left by the artisanal miners. All properties are in the same trend and in the case of Niangouela it is literally just outside the highway going direction Mali, meaning transportation and exploration costs are reduced as access is relatively easy. The major local center nearby is the city of Yako. Other notable miners in the are are the Russian gold miner Nordgold, that owns the Bissa mine and the Karma mine, operated by Endeavour (EDVMF). All properties are currently optioned from the Burkinabe mining agency, while the Nianguela property was previously owned by Cluff Gold). Bouboulou and Niangouela projects in contest (September 2017 Corporate Presentation). The 178 square km Niangouela gold concession is located on the Boromo greenstone belt, and is very close to the Kalsaka and Sega deposits and mine (previously owned by Cluff Gold and Amara Mining) and the Sabce shear. In this region of Burkina Faso gold is generally associated with quartz veins. The company has delineated a 1 km quartz vein and shear strike with samples taken at depths of around 46-60m. 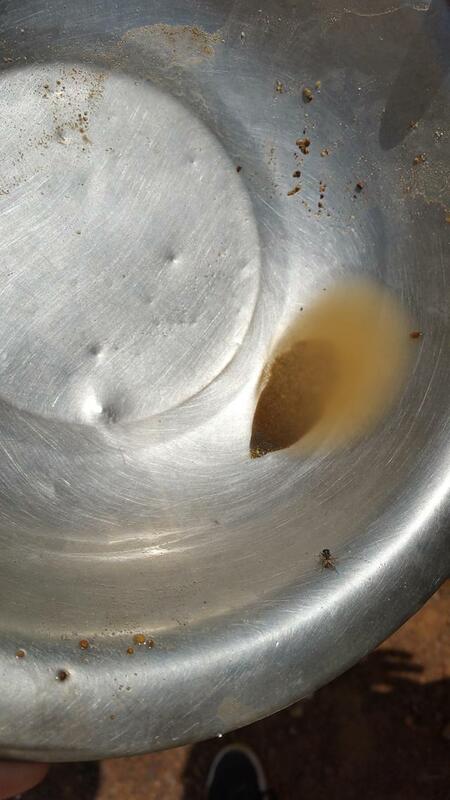 The best sample was the NG005, taken from the primary quartz vein at 46 metres below surface in an artisanal shaft, returned a value at 2,950 g/t gold. Eight of the first nine diamond drill holes on the property returned positive gold intercepts, highlighted by a 4.85m intercept at 26.69 g/t, including one metre at 132 g/t. 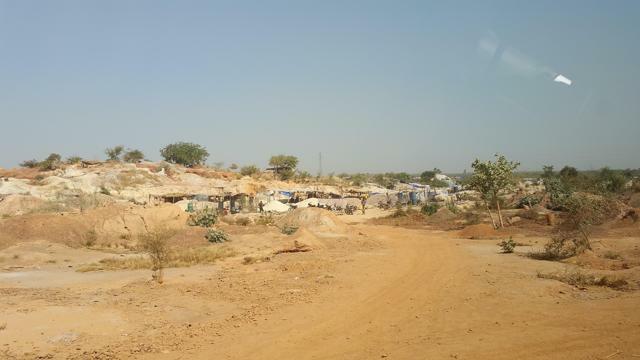 There is a sizeable artisanal miners village over the property as you can see in the picture below. The artisanal miners village present on the property (Fabio Herrero 2017). 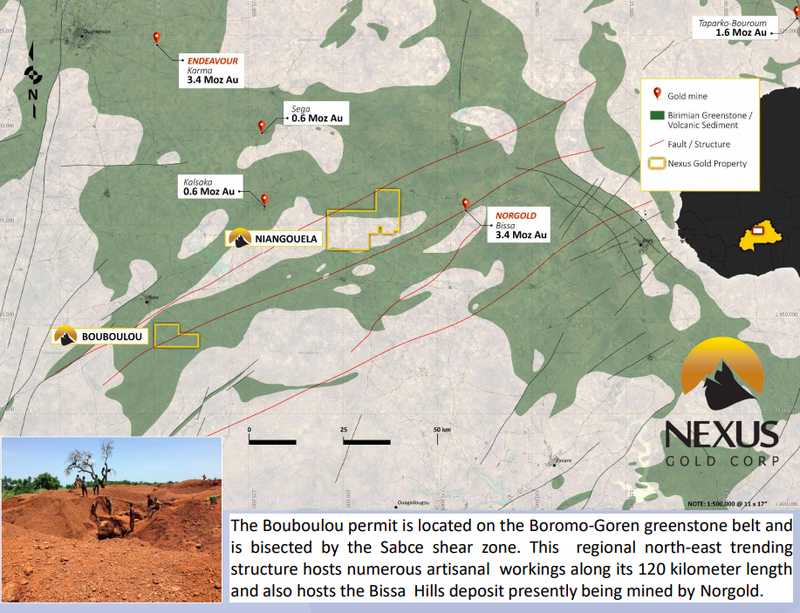 This 38.8 square km Bouboulou gold concession was previously explored by Riverstone Resources and Roxgold. The property sports numerous near-surface gold occurrences in three gold trends, each extending for around 5km. Historical drill results include: 40m of 1.54 g/t, including 20m of 2.25 g/t; 35m of 2.2 g/t, including 12m of 5.45 g/t; 10m of 2.84 g/t, including 2m of 12.45 g/t and 4m of 12.53 g/t. These tiny little yellow sparks are gold particles collected by an artisanal miner on the Bouboulou property (Fabio Herrero 2017). The 250 square km Rakounga gold concession is contiguous to the Company’s Bouboulou property, bordering Bouboulou on the west and south sides. Rakounga also features several artisanal miners sites. Koaltenga is the largest with up to 800 metres of strike length. The porphyry orpaillage measures approximately 150 metres in length, hosted in plutonic rocks. Gounga is the smallest orpaillage, measuring approximately 75 metre long. The Bouboulou 2 and Pelatanga-Rawema gold trends extend southwest from the Bouboulou property on to Rakounga. There is significant artisanal mining activity along this trend, indicating gold mineralization extends for some distance. Warren Robb believes as being this to be the most promising project of Nexus’ portfolio. This properties, as the others, need more exploration to determine the extent of these mineralised zones. 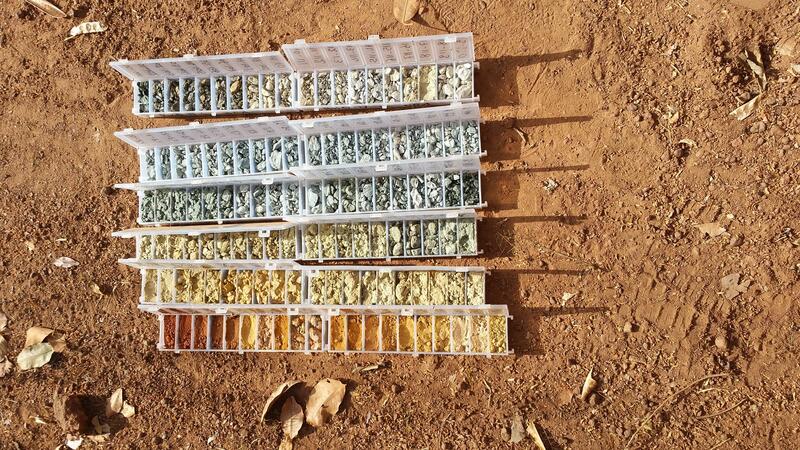 The chips of the RKG 17 RG-001 RC drill hole, you can nicely see the different colours of the different geological strata (Fabio Herrero 2017). To conclude Nexus is a nimble new player that is drilling on land that obviously contains gold bearing structures and trying to delineate the first gold deposits. As many small explorers, it will need more money to explore further. Management fees and general and administrative costs are reasonable however and kept to the bare minimum, meaning that the majority of the money goes directly into exploration and this is good for investors. I will keep Nexus in my watchlist to see how it evolves and write about it again if warranted. Central banks traditionally purchase gold as an asset that has a low correlation with other financial instruments and does not depend by other foreign powers. Russia is accelerating the pace of gold purchases, that it executes directly by buying domestic production, since the 2014 US-led sanctions. Gold (GLD) is money. As such central banks (CB) purchase it to back their own currencies as it can be easily sold at any time and place in case they need to defend their currency. Nowadays central banks generally prefer to own a diversified portfolio of currencies and financial instruments. This can be composed by foreign currencies, foreign government bonds, corporate bonds, mortgage backed bonds, shares in companies national and foreign companies and in the case of the Bank of Japan, even ETF’s (the Bank of Japan now holds an astounding 75% of the nation’s ETFs.). Nonetheless gold is at the center of the CBs strategy as it is perfectly liquid at any time and in any market condition, while the price and value of it cannot be influenced by foreign countries. This is important inasmuch as foreign reserves are denominated in foreign currencies and the value of those or the possibility of redeeming these investments are dependent on foreign countries. Two countries that have signaled their will to be less dependent on foreign powers are China and Russia. It makes then perfect sense for these two countries to try to allocate a bigger portion of their CBs assets in gold, instead of foreign currency denominated financial instruments. According to the World Gold Council, CBs demand was up 20% year over year in Q2 2017, totalling 94.5t for the quarter and 176.7t year to date. The increase in global gold reserves was almost entirely driven by sizeable purchases from a small number of central banks. The three biggest purchaser were the CB of Russia that added 100.6t in. Russian gold reserves stood at 1,715.8t at the end of June. In 2015 and 2016 the increase was of around 200t and it looks like the Russian CB wants to buy a similar amount for this yaer. Notably the other two major buyers were also located in Eurasia: Kazakhstan extended its buying run to 57 consecutive months, with gold reserves growing by 11.3t during Q2, while the CB of Turkey bought 21t during the quarter. Russia’s interest in gold has reached new levels over the past decade. Over the past decade, the Russian CB has added more than 1,250t to its gold reserves, taking its holdings to about 1,700 tonnes (an almost fourfold increase), hoarding the sixth largest gold reserves in the world. In Q2 2017 alone, Russia accounted for 38% of all gold purchased by CBs. “We are adhering to the principle of reserve diversification. This principle remains unchanged. 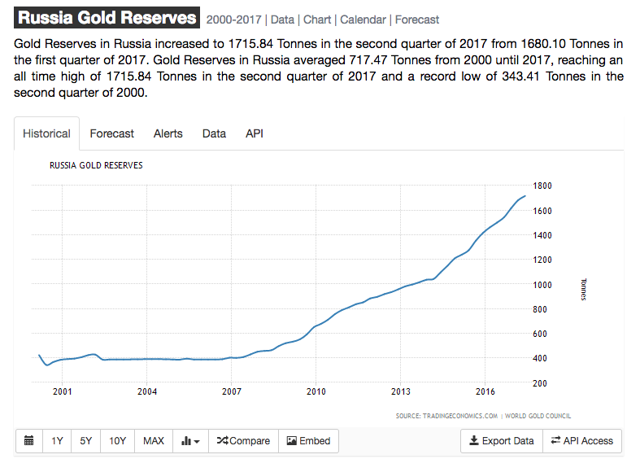 From this perspective, our reserves do include gold.” Tulin has also stated that the Bank of Russia has been increasing the amount of gold in its reserves, as only this reserve asset provides total protection against legal and political risks. Mr Turner is here referring to the sanctions that the US and its allies slapped against Russia after the annexation of Crimea the 18 march of 2014, as well as the more recent sanction mandated by the US Congress for the alleged interferences into the US elections in 2016. Russia is not only hoarding gold in order to protect herself from legal and political risks. The national production has almost doubled since 1995 and today, Russia ranks third on the list of global producers, behind China and Australia. Production of more than 300 tonnes is expected this year, rising to 400 tonnes by 2030, according to Sergey Kashuba, Chairman of the Union of Gold Producers of Russia. The Russian CB purchases gold chiefly from domestic miners through commercial banks and not in the open market. Below a visualisation of what is happening. As you can see the pace of purchases is accelerating since the first round of sanctions in 2014. 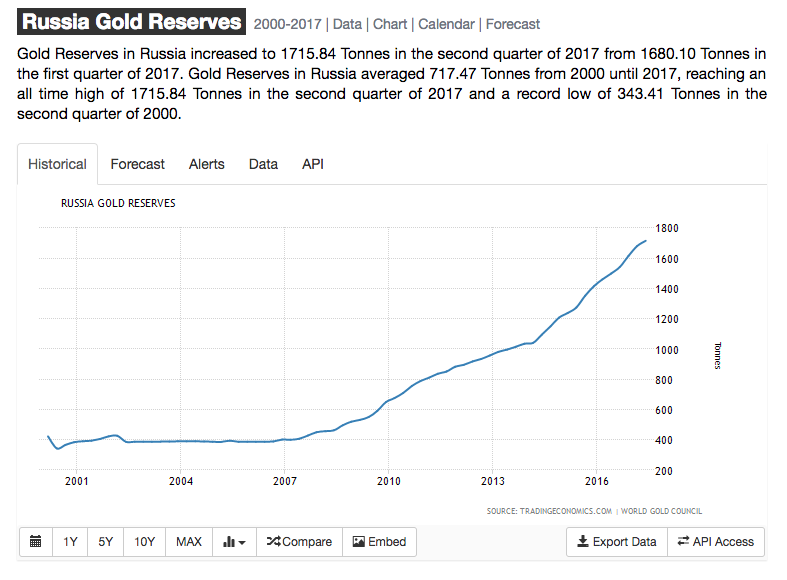 Russia Gold Reserves (Trading Economics). At its current pace, Moscow will unseat China for the number five spot of gold-holding nations by the first quarter of 2018. China has been the world’s biggest gold producer for 10 years and the largest consumer of the metal for four years and aims to increase its annual gold output to 500 tonnes by 2020 from around 450 tonnes currently. All this is good news for the gold price. CBs can print an infinite amount of their currencies and buy gold that is in limited and only slightly increasing amount. The only way forward is hence a higher USD denominated gold price.